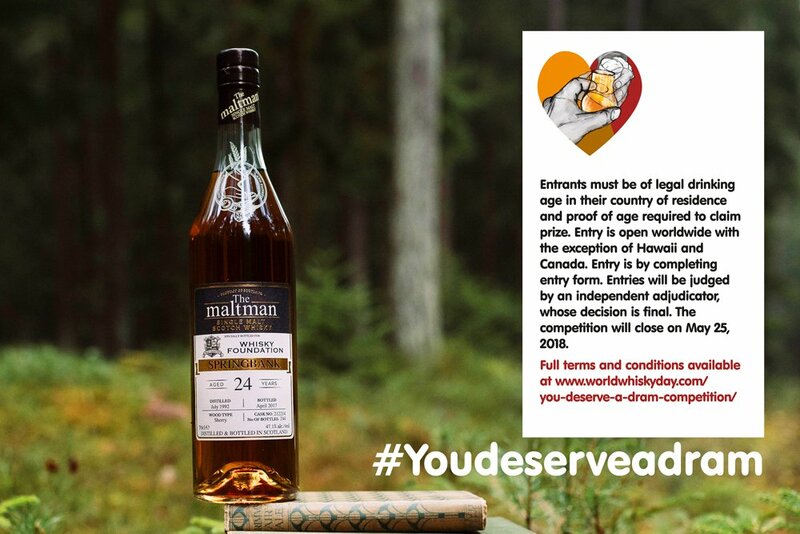 Entries are flooding in telling us who deserves a dram, and why, for our You Deserve a Dram competition to win a Bottle of Springbank 24. Here are six stories that have caught our eye so far. There’s still plenty of time to enter – can you top them? My old man, I’ll tell you why. His ambition, being of the larger stature, (weight not popularity) was to climb Ben Nevis and to open and drink a bottle of Springbank 1966 Local Barley that he had bought some 40+ years ago. It was his 60th birthday and that’s what he wanted … We made it to the top in record time – not – and cracked it open only for me to use my big size 10 boot to send the bottle flying half way down Ben Nevis. Rumour is it’s still there to this day. At least he enjoyed the dram he had. I did not enjoy the car journey home … help me out to repay the man. My marvellous wife, Belinda. For insisting that we travel from Melbourne all the way to Campbeltown so I could tick visiting the Springbank distillery off my bucket list. For demanding we then go to Islay and visit each distillery on the island. For patiently driving the campervan the whole time so I could indulge to my heart’s content, and bringing me tea and biscuits when I woke up from whisky-induced naps. For giving birth to our first child two weeks ago. And for allowing me to call our beautiful daughter Isla. I think my husband Derek Mather should win as he always puts his customers first when he is trying to educate them about whisky in the restaurant and also driving me crazy with his Bruichladdich collection which is just about to hit 1000 different bottles. He also has 3500 whiskies at the restaurant of which 2200 are open for customers to try. I would like to nominate Amy Seton as a Drampion (that’s dram champion). I have been a whisky fan since the tender age of 18 (when me and my dad would natter over a drop of Talisker or Oban into the wee small hours), but it was Amy who fanned the flames of my whisky obsession. Through attending events with The Birmingham Whisky Club I’ve not only been given the chance to try whiskies from all over the world, but also meet the personalities behind the brands and learn so much about maturation, distilling and the science behind the taste of different liquids. She’s managed to turn something I liked into a lifelong obsession, and I know I’m not the only one who would say that. This is an easy answer for me… it would have to be my father. He deserves a dram for many reasons. He introduced me to whisky many years ago. We have tried and tested every bottle he owns, usually whilst listening to music and chatting. Now I am the one recommending bottles, and taking samples for him to try. I know this would be a cracking bottle to share, and I’m pretty sure he has never tried Springbank. He tends to drink whisky on either end of the spectrum: i.e. either sweet sherried, or peaty smoke. Springbank has its own unique characteristics, and will definitely cause some debate. I’d pair this Springbank with some Tom Waits, both are funky, but in the best way possible. This is a cool malt I can introduce him to, and goes some way to paying him back for all that whisky he has shared with me. And to the bar he was sent. Mmmmm this whiskey journey could get him into strife! A chance for a whiskey now never goes to waste. With friends and family to….